The Disney Dining Plan options are worth serious consideration when you are booking your Walt Disney World Resort Vacations. By adding the Disney Dining Plan to your vacation package you can turn your Disney World experience into a nearly all-inclusive type vacation. There are 3 main Disney Dining Plans that most people consider: Disney Quick Service Dining Plan, Disney Dining Plan, & Disney Deluxe Dining Plan. Below you will find details as to what each one offers and the prices for each. Also each guest will receive one (1) Resort refillable Drink Mug good for unlimited drink refills at your resort for the duration of your stay. for each night of your stay. Note: Disney World has been typically raising the meal prices at the Buffet Restaurants during the peak season in years past, and they have made it part of their pricing for the Disney Dining Plan as well. The Disney Deluxe Dining Plan allows the guests to enjoy the best that Disney World has to offer in terms of Dining experiences with 3 Table Service Credits per day. This allows you to eat either 3 sit down meals per day or to use some of the credits to try some of Disney World's Signature Restaurants that require 2 Credits per meal. Plus each guest will receive one (1) Resort refillable Drink Mug good for unlimited drink refills at your resort for the duration of your stay. Look at Restaurant Menus ahead of time to gauge entree prices. If they are not greater than $20.00, you are not getting your money's worth. Save the restaurants with less expensive entrees for a trip without the Dining Plan. Disney Character Dinners are a great use of Disney Dining Plan Credits. 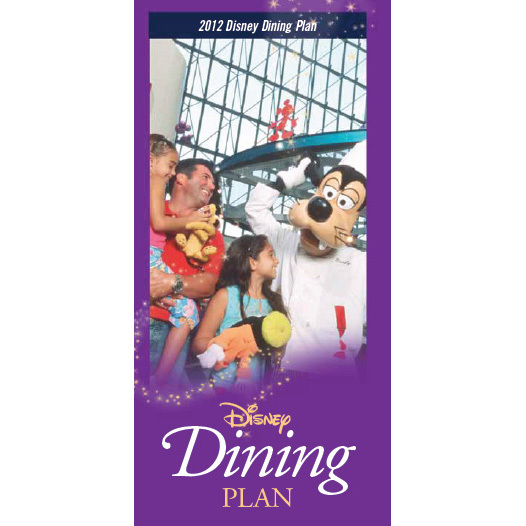 Top non-character places to Dine with the Disney Dining Plan: Cape May Cafe, Boma, 'Ohana, Le Chefs de France, Biergarten, Restaurant Marrakesh, Coral Reef, San Angel Inn Restaurant, Portobello, Teppan Edo. Don't forget about the snacks. There are lots of great items that you can obtain with your snack credits. Don't settle for a cup of coffee or a bottle of diet coke, seek out the Carrot Cake Cookie, ButterFinger Cupcake, or the famous Dole Whip! Gratuities are not included in any of the plans, so keep that in mind when you are budgeting for your trip. There are many great Quick Service Meals that actually may have enough food to feed two! You can use this technique to save Quick Service Credits so that you can use some for breakfasts. Remember that the credits do NOT expire until midnight of the day that you check out. 1 comments to "Disney Dining Plan: 2012 Prices & Tips To Get Your Money's Worth"
I am so grateful to stumble on this post! Everybody wants a terrific yet less expensive Christmas in Disney vacation but the expenses makes me so doubtful of a Disney trip this summer. Reading your post makes me realize that Disney trip doesn't have to be grand and you have lots of ways to save not just money but as well as time. Thanks for sharing a very practical tips!